Where Is Mongolia: Is Mongolia a Country? Is Mongolia Part of China? Officially: No, Mongolia is not a part of China. Mongolia is a sovereign state in Asia and boasts its own language, currency, prime minister, parliament, president, and armed forces. Mongolia issues its own passports to citizens for international travel. The three million or so residents of the sprawling, landlocked country proudly consider themselves to be "Mongolian." Lots of people erroneously believe that Mongolia is a part of China because Inner Mongolia (not the same as "Mongolia") is an autonomous region claimed by the People's Republic of China. Tibet is another famous autonomous region occupied by China. Technically, there is no such place as "Outer Mongolia"—the correct way to refer to the independent state is simply just "Mongolia." The labels "Outer Mongolia" and "North Mongolia" are sometimes informally used to contrast Inner Mongolia with the sovereign state. The way in which you refer to Mongolia has some political connotation in Asia. What is known as Inner Mongolia shares a border with Russia and the sovereign, independent state of Mongolia. It is an autonomous region that is considered part of the People's Republic of China. Inner Mongolia became an autonomous region in 1950, well before Tibet. Following the collapse of the Qing dynasty in China, Mongolia declared its independence in 1911, however, the Republic of China had other plans for the region. Chinese forces occupied part of Mongolia until Russia invaded in 1920. A joint Mongol-Russian effort expelled Chinese forces. Russia decided to support the creation of an independent, communist government in Mongolia. With the Soviet Union's help, Mongolia once again declared their independence — ten years after the first attempt — on July 11, 1921. Only in 2002 did China stop considering Mongolia as part of their mainland area and removed it from maps of their territory! Ties with Russia remained strong, however, the Soviet Union forcefully established a communist regime in Mongolia — utilizing nefarious methods such as execution and terror. Unfortunately, Mongolia's alliance with the Soviet Union to thwart China's dominance resulted in plenty of bloodshed later. During Stalin's "Great Purge" of the 1930s, tens of thousands of Mongols, including scores of Buddhist monks and lamas, were executed in the name of communism. The Soviet Union later helped defend Mongolia from the Japanese invasion. In 1945, one of the conditions for the Soviet Union to join the Allies in the fight for the Pacific was that Mongolia would keep independence after the war. Despite the struggle for independence and a bloody history, Mongolia still somehow simultaneously maintains good diplomatic relations with the United States, Russia, China, Japan, and India — countries that often have conflicting interests! In 1992, following the collapse of the Soviet Union, the Mongolian People's Republic changed its name to just "Mongolia." The Mongolian People's Party (MPP) won the 2016 elections and took control of the state. Today, Russian is still the most widely spoken foreign language in Mongolia, but the usage of English is spreading. Despite its enormous size, Mongolia is the most sparsely populated sovereign country in the world. Per a 2015 study by the United States, the estimated population was only around three million people, although getting an accurate count in such a nomadic place is nearly impossible! The most recent population estimate for Mongolia was performed by the U.S. Census Bureau. Not everyone agrees with that number, including the U.S. Department of State! They opt to use the United Nations' more conservative estimate from 2009 of 2.6 million people. According to a 2015 World Heath Organization ranking, Mongolia ranks poorly (122nd) in life expectancy. Average male life expectancy is only 64.7 years old. The Great Wall of China runs roughly along the southern border of Inner Mongolia. Despite being one of the greatest endeavors in human history, it was not successful at keeping out the Mongols. And, no, it isn't visible from space. According to the United Nations, the fertility rate of Mongolian women is declining faster than in any other country. Although we mostly associate Mongolia with the Gobi Desert and nomadic tribes living in Yurts, there are big cities! 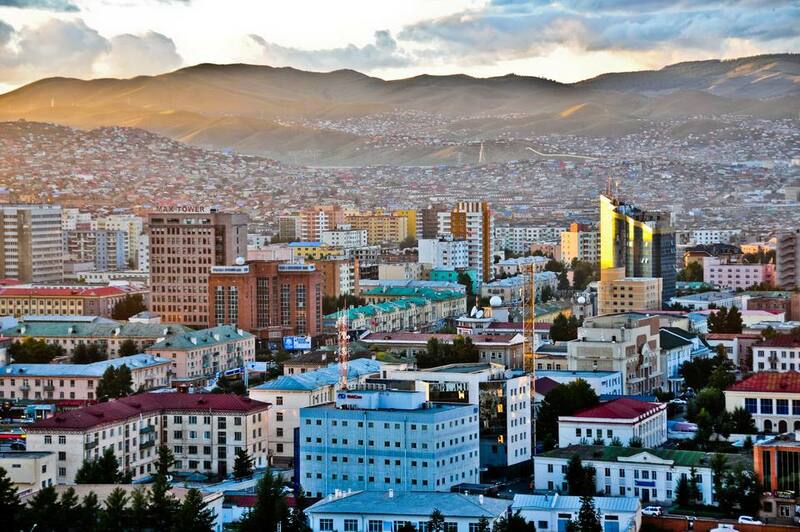 Ulaanbaatar, the largest city in Mongolia, has a population of over 1.3 million people (roughly the same as San Diego, California). Because of its location and elevation, Ulaanbaatar experiences extreme swings in temperatures. The average annual temperature is only 31.3 F, however, extremes from minus 44 F to 102.2 F have been recorded. Alaanbaatar suffers from a high level of fine-particle pollution — among the worst in the world — due to dust. Particulate matter is responsible for chronic respiratory problems. The Gobi Desert is spreading at an unprecedented rate causing the loss of grasslands. Mongolia has the highest rate of liver cancer in the world. Because of the climate, Mongolian cuisine consists mainly of meat and dairy with very few vegetables. Vodka is the most prominent alcoholic beverage. The "Mongolian grill" part of your favorite Chinese buffet where patrons choose meats and ingredients to be cooked in front of them has nothing to do with actual Mongolian food or cooking techniques. That style of restaurant first began in Taiwan in the 1950s. Authentic Chinese food often differs greatly from "Chinese" creations that came about outside the country while it was still mostly closed off. Mongolia typically enjoys over 250 sunny days per year. Riding a horse across the plains and spending time with nomads in yurts are among the most popular adventure travel activities in Mongolia. Some of the first dinosaur eggs were found in the Gobi Desert. Sea turtle fossils were also found, indicating that the desert was once under water! Don't Travel to a New Country Without Doing These 10 Things!